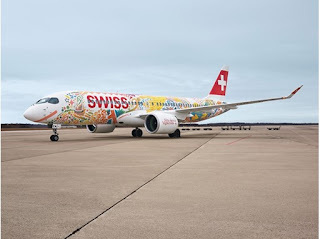 SWISS, the international airline of Switzerland has lifted the covers on a specially painted livery on one of its advanced CS300 aircraft at its home base of Geneva Airport. The aircraft has been given this bright and colourful special livery to honour and highlight this summer’s Fête des Vignerons festival in Vevey in Western Switzerland, for which SWISS is the principal supporting partner. The livery has been designed by Western Swiss artist Mathias Forbach (alias Fichtre) to mark this long living tradition. Festival director Daniele Finzi Pasca paid tribute to Fichtre’s artistic creation by serving as the “godparent” to the aircraft. The unveiling was also attended by Vaud State Councillor Philippe Leuba and Geneva State Councillor Serge Dal Busco. SWISS already dedicated its first CS300 aircraft – “L’Avion des Suisses Romands” – to Western Switzerland and its inhabitants back in 2017. The company is now underlining that commitment to the Romandie by commissioning another special livery to mark the Fête des Vignerons, a celebration that will move and delight the people of Western Switzerland and beyond later this year. To ensure a certain consistency between “L’Avion des Suisses Romands” and the newly-decorated aircraft, SWISS has again turned to Western Swiss artist Mathias Forbach, alias Fichtre, to design the new livery. The choice is even more appropriate in that the artist is from Vevey, where the Fête will be held.Fichtre’s guiding goal for his new livery creation was to awaken the memories of the last generation which experienced the Fête des Vignerons and to arouse the interest of a new generation with a modern and contemporary design. With its spontaneous, colourful and festive style, the new livery captures the spirit of the Fête and draws its inspiration from many of the features that make it so unique.The colours and images used reflect the cycle of the seasons that give their natural rhythm to the winegrowing world. Nature features strongly in Fichtre’s livery composition, which has incorporated elements of the local Vevey landscape such as Lake Geneva, the vines, the autumn leaves and (of course) the grapes. The specially-liveried SWISS CS300 (CS300's are now under the Airbus umbrella and listed as A220-300s) will be deployed throughout Europe over the next nine months. The aircraft will serve 42 destinations from Geneva including Palma (in summer), St. Petersburg (in winter) and Dublin (all year round). And it will carry over 150,000 passengers in its festive colours. Mathias Forbach (Fichtre) was born in Vevey in 1983. He attended the Lausanne University of Art and Design (ECAL), graduating in 2005 with a Bachelor’s Degree in Media & Interaction Design. Since 2009 he has been teaching at the School of Design and University of the Arts in Sierre in Canton Valais. And in 2012 he decided to continue his own artistic education by following the Work.Master programme at the Haute École d’Art et de Design (HEAD) in Geneva. In 2014 he co-founded the STADIO art space in Vevey together with Joëlle Nicolas, Guillaume Ehinger and Jacques Duboux. He was awarded a Master of Visual Arts degree in 2015.An independent spirit among graphic artists, Fichtre uses drawing and illustration as a means of experimentation and research. The surface is central to his approach – a creative baseline that is constantly being challenged and renewed. The surface, to Fichtre, is a polymorphous vehicle, a venture of infinite potential, a renewal of every graphic language. As such, it becomes a “hypersurface”: a continent of indistinct borders, and a reminder that visual art, too, has no limits or constraints. / www.fichtre.ch -- -- -- .